We've had weird weather here this summer. Most of June was cold and rainy and more like April than June. At the end of the month, things finally shaped up, and the normal June weather — perfect warm sunny days with almost no humidity, followed by perfect clear and cool nights — hung around right through the middle of July. In that sort of weather, there's no need to pack away your fall and winter favorites: you can wear any perfume you like. Then just when I'd been lulled into complacency, summer started first thing yesterday morning, and with a vengeance: hot, humid, generally nasty, with the added thrill of a late afternoon thunderstorm. The Estée Lauder Jasmine White Moss I was wearing happily the week before? No way would I have worn that yesterday. So. Here are four unisex fragrances from the indie house of Dawn Spencer Hurwitz. Three greens, one citrus, and all four can make it through the nastiest summer heat. Whoosh! What a rush we get from this Autumn's scent, Wasabi Shiso! It's green, peppery-freshness (the wasabi) and unusual fruit-like leaf note (shiso) give our new creation true originality. I can vouch for the Whoosh! — I first tried Wasabi Shiso when I was just starting to recover from a long bout of respiratory illness, and the opening is a wonderful way to clear your sinuses (the notes: shiso accord, wasabi accord, yuzu, bergamot, holy basil, pittosporum accord, Russian rose, vetiver, elemi, sandalwood and patchouli). It's strong and green and herbal, with the wasabi adding heat and the shiso (which smells an awful lot like cilantro) adding a lovely touch of bitterness. The initial assault calms to something softer, but it stays vibrant and true to its name for a darned long time. A little offbeat, very enjoyable and a perfect green scent for summer. Wasabi Shiso is available in a variety of formats and concentrations, including Eau de Parfum and Water-based Body Spray, prices $20 - $56. A modernist approach to interpreting mint in fragrance; it is wonderfully cool and fresh, but "more Green and like a garden than like chewing gum". I don't know that I can entirely vouch for the last part — I'm not even sure it's possible to do a mint-focused fragrance that doesn't evoke chewing gum, in the same sense that almost no matter what you do with lemon, it's going to remind someone, somewhere, of cleaning products. My favorite mint fragrance, Guerlain's Aqua Allegoria Herba Fresca, most certainly reminds me of chewing gum, and I have no objection to that. So Menthe Moderne starts citrusy and bright, and to me, chewing-gum-ish, but it's also soft and round; it doesn't have the same slap that you get from the rather sharp citrus opening of Herba Fresca. Menthe Moderne is also far heavier on the mint, at least in the early stages — in combination with the fir balsam, that lends a cooling feel that's perfect for humid summer days (the notes for Menthe Moderne: bergamot, lime peel, spearmint, green tea, peppermint, petitgrain, silver fir, violet, Virginia cedar). I love the first 45 minutes or so, after that, it's paler, cleaner, milder, gentler...too much so for my tastes; I found myself wanting to reapply frequently for the fun of the top notes. In the end, I prefer my beloved Herba Fresca (anyone know if Herba Fresca has been reformulated lately? probably so), but Menthe Moderne is certainly worth a shot if you're still looking for your perfect mint, and it's apparently one of the top 10 sellers in the Parfum des Beaux Arts line. Menthe Moderne is available in Eau de Parfum or Parfum, prices $25 - $125. Grapefruit, as many of you are well aware, can be a difficult note on skin. This one is not only gorgeous, it's easy to wear — not a trace of cat urine or sweat anywhere. The opening is bright and cheerful and sparkling, and just slightly sweet: think lightly sugared pink grapefruit (the notes: bergamot, green mandarin, mandarin, pink and white grapefruit, neroli, lemon, pomelo, green tea and sandalwood). As it dries down, the grapefruit fades just slightly and the neroli picks up steam. Please don't be disappointed when I tell you that's pretty much the whole story — the world needs a perfect grapefruit 'solifruit', and we certainly didn't get it with Marc Jacobs Grapefruit Splash. The lasting power is very good, and especially so for something that's apparently made with 98% botanical ingredients, still, you might need a touch-up in order to make it through an 8 hour work day. This is what I'd like to have in my refrigerator, in a huge spray bottle, on the hottest summer days (with apologies to its fans, I've never really cared for 4711). Added bonus: Pamplemousse layers beautifully with Wasabi Shiso, and undoubtedly with other things as well. Available in a variety of formats and concentrations, prices $30 - $70. Viridian is part of the aroma-color series, and reportedly "...embodies the concept of a rich foresty green color in aromatic form". That's a perfect description: Viridian is a darkish green, out-in-the-woods scent, made velvety plush by iris (the notes: angelica, artemisia, bergamot, celery seed, aloe accord, chrysanthemum, galbanum, orris, sandalwood, vetiver, oakmoss, lovage, myrrh gum, patchouli and violet leaf). It isn't the bright cheerful grassy green of Miller et Bertaux's Green, green, green, green, nor is it the buried-in-bushes GREEN! of Gobin Daudé's Sous Le Buis. This is murkier, more earthy-mossy and damp, and might especially appeal to those who love the earthier renditions of iris. Lovely. Available in Eau de Parfum and Parfum, prices $27 - $135. For buying information, see the listing for Dawn Spencer Hurwitz under Perfume Houses. 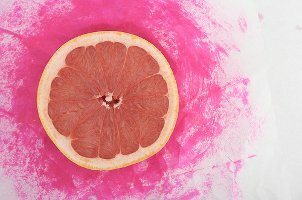 Note: image is Pink Grapefruit by geishaboy500 at flickr; some rights reserved. I’m not sure it’s about the sophistication of your nose so much as just what mental connections you make. The lemon = cleaner thing, for instance, I think will disappear over time now that cleaners smell like most anything on earth, not just lemon. I have sampled both the DSH Menthe Fraiche and the Soivohle Geranium Rose Mint. Both are worth a sniff, but I love the Soivohle more. My absolute favorite mint is Heeley Menthe Fraiche– really refreshing when the temperature rises. No, not to someone who is already spending $60 a month on samples. Yikes–seeing that in print is kind of a reality check! My favorite summer DSH is Indochine. It’s a very unique scent, sort of ginger-lemongrass-floral-musk. Might be a little too feminine for most guys. Excellent lasting power, even in the furnace-like heat of Austin (today’s projected high: 103). I wish I got damp green and iris out of Viridian! It mostly smells like celery seed on me. Oh, well. I’ll have to try the Indochine, that sounds wonderful! I get lots of celery seed in the top notes, but I love celery seed. Reminds me of CdG Calamus, another favorite green of mine. I bought DSH samples recently, but not one of these! I love Shiso (to smell and to eat in my favorite sushi rolls — the real leaf is not cilantro-like at all to me). Not sure I’d want to smell like horseradishy wasabi, but this sounds interesting enough to try. I’m still dying to get some of that Roger & Gallet Shiso Body Spray, which sounds perfect. Everyone knows I’m a grapefruit fiend: how does the DSH compare to the new Hermes Pamplemousse Rose Cologne for you, R? I am at 58 degrees here at the beach. Geez! These summer scents all sound great but I’m going to be putting on one of the heavy hitters today…. Somehow the sound of anything with mint just makes me shiver! Oh, that’s too darned cold for July! Don’t we LOVE summer, er. Winter in San Francisco! It does give me a giggle to see tourists in shorts down at Fisherman’s wharf. They’re probably from the upper midwest. Up here, if it’s above 40*, shorts are perfectly acceptable. Sitting here at 60* today, think we broke the record for lowest high temp. Rapp – that was us yesterday. Our high temp for the day was around 60*, and cloudy, gloomy, and just a little rain. We were in the humid 90s back in May….it’s just nuts. Of course this is a perfume blog….so in between bouts of weeding I perused the DSH website…Cringing when I realized I had over $60 in samples in my cart….I was saved however by fixing lunch…when I came back to the computer : my cart had emptied itself !!! Maybe this is how I save myself money….just keep filling the cart, then taking so long that they keep emptying when I’m not looking!! sigh…and I have so many unsniffed samples sitting right here…sick, I tell you! sick!! I want to try that R&G too. I do wish someplace near me carried R&G and had testers. And do tell how the Arnica is…I did not try that one. The DSH is rounder & sweeter than the Hermes…the Hermes is more elegant, the DSH is more cheerful. I’ve worn the Shiso by R & G and it’s lovely. Very soothing and refreshing at the same time. Interesting! I would try the Shiso and the Viridian. Maybe not the other two — I’ve noticed that minty and grapefruit-heavy fragrances are hard for me to wear (perhaps they’re just inherently tricky?). All of these sound good to me — but especially the Viridian! We’ve been having crazy weather — the last two days were hot and humid so that I couldn’t even contemplate any “fall” fragrances, but today is so cool and breezy I’m actually wearing EL Pleasures Delight which I wouldn’t have gone near yesterday. Viridian, I think, is probably seasonless. I was surprised they called Wasabi Shiso a fall fragrance, but everybody has their own idea of what to wear when. I’m with you on the EL — would not wear that in hot humid weather. I am fascinated by the Wasabi Shiso, although I can’t imagine actually wearing it. My favorite scent featuring shiso as a note is Apothia Pearl, but that is an entirely different type of fragrance. Sample time? VERY different fragrance, and the shiso is much stronger in the DSH. I’m not sure that I smell shiso leaf at all in Pearl. And even if I could, there is nothing green about it. I do think that I will need to try the DSH. It sounds so….bracing? Yes, bracing is exactly right! Great review and descriptions Robin – thanks! I’ve only recently started ordering samples and testing the DSH line and a couple of these sound like they need to be added to the list. And do tell me if you’ve found a wonderful DSH scent…I’ll never manage to try them all! I remember, a few months into my newfound love of perfume, stumbling across DSH’s website and being totally overwhelmed by the selection. But everywhere I turn, I hear such good things about the line. I might have to take the plunge. Viridian sounds beautiful but Charlotte above noted it smells of celery seed, a note (and flavor!) I’ve never liked. That might be a deal-breaker. I live in Houston, so I look enviously at your daily highs. But I have an almost masochistic desire for really heavy perfumes in the heat. I just bought a sampler of Guerlain’s masterpieces in parfum and they’re filling the position nicely. Fighting fire with fire! I live in Houston as well, and I’ve been trying not to be insanely jealous of all the people with unseasonable cool weather. Sigh. I just keep reminding myself that we also don’t get buried by snow for three months or more a year. I had been wearing heavier scents for most of the summer – even though it’s beastly outside, it’s usually frigid inside, but I finally gave up this week as it’s seemed particularly nasty and started with the lighter scents. I’m terribly tempted by both the wasabi and grapefruit scents – the wasabi because it sounds so interesting and the grapefruit because I really want to find a non-cat urine grapefruit scent. Does anyone now how the DSH compares with the Guerlain Pamplelune? I will say that the Guerlain is almost exclusively cat pee on me…I just can’t wear it. Well, I’ll pass on buying an unsniffed bottle from fragrancenet then – lol. I’d live in 12-month winter if it were feasible. I’d settle for somewhere where 9-month summer can’t find me, though. When I wear summer scents, though, I seem to feel hotter. The cold weather, heavier scents really bloom when you sweat, though. I’m wearing L’heure Bleue parfum today and it’s heavenly. I agree with Robin about the Pamplelune: sulfurous nightmare. I had a friend who loved it on her though, so it’s worth trying i would say. I’ll have to see if I’m in the mood for it the next time I do a sample order – I’ve put it in my shopping cart a few times and taken it back out in favor of other things – it lost out to Joy last time. Of course, between my last two sample orders, the swap I just did, and my sample set from Czech & Speake arriving today, it will be awhile before I (should) order samples again. Maybe someday I’ll actually wear some of my FBs. I really like it, just maybe not enough to commit to more yet. =P I’ve tried Joy in everything but the modern parfum, even some vintage samples at estate sales and I just can’t say I like it. My FB’s won’t be seeing the light of day for awhile, I fear. Might I recommend…Minnesota? LOL! It can snow anywhere from October to April here. Or you might try Alaska…or Canada…or maybe Helsinki. Actually, if it weren’t for how dreadfully dark the winters are, I’d seriously consider moving to Helsinki for the slower pace of life. Of course, I don’t speak the language(s), so my husband would have to be the one working…..
Ha ha – that’s what I tell myself when the summers are beastly hot here because I hate being cold. If I could find somewhere that the daily highs were between 45 – 80 degrees year-round, I’d be happy. The selection really is overwhelming. There are lots of good reviews at MakeupAlley though, that helps. Just wanted to say a quick hello and thanks for the awesome post! I’m really glad to see Wasabi-Shiso here since it’s quite unusual and just the notes can sound scary to some. The Shiso leaf accord I was working from to develop this scent was based on both purple and green shiso leaf varieties I was growing in my garden last summer and the purple shiso especially came up less fruity / tangy and more herbal, and cilantro-like . (I think the fact that I have pine trees also effects what happens in my garden as many greens seem to come with a little terpenic kick to them). I have to say that it’s great fun growing flowers and herbs to derive new accords from. Smelling things as they are growing and changing is so enlightening as to the true nature of a plant compared to just an essence of it. You know that old movie where James Cagney reaches acorss the breakfast table squashes a half grapefruit in his wife’s face? That’s how I feel wearing Pamplune. Hmm… is that a good thing or a bad thing? I guess it depends on if the grapefruit gets in your eye or not – lol. See, to me that would be a GOOD thing. Pamplelune just doesn’t smell like grapefruit on me. And I am prematurely in love with the notes in Viridiana. Gonna give it a try for sure! DSH indeed has a HUGE variety of scents to choose from, but you really have to take the time to sift through them all to find the one(s) that are right for you. I’ve gone through close to 40 samples and have barely scratched the surface, LoL! So far, some of my favorites include Parfum de Lux, Cafe Noir, Everesse and Gypsy (the latter 2 discontinued). She also makes bath and body products in affordable sizes for most of her fragrances so you can wear one scent during the day, shower in another, and moisturize with a 3rd – and it all works! I don’t think I’ve tried any of your favorites, and I’ve tried quite a few at this point! The 1st 2 are from the Perfection Connoisseur collection. I think Donna wrote about Cafe Noir a while back in her DSH series in PST. Parfum de Luxe is a rich spicy floral that makes me think of the older Rochas Femme. The other 2 are from the Essence Oils collection, but both are sadly discontinued. Gypsy is a rich leathery/smoky floral and Everesse reminds me of the Coty solid floral perfume trios from the ’70s – fresh (in an old-fashioned way) and lovely. I can vouch for the Pamplemousse, which I adore, and Viridian – the latter is so green with galbanum and celery that it smells “chewy” like grass. It settles down a bit after a while, but it never, ever goes sweet. It’s the greenest perfume I have ever smelled. Good, glad to find a fan! Oh, wasn’t Viridian included in that set?